Maximize media exposure for your experts. Visibility in over 15,000 newsrooms. When it comes to expert content, journalists are always on the hunt for credible, engaging sources. Every day, they seek out experts who can provide valuable insights on trending topics and emerging news. To help your increase your visibility with these audiences, we’ve established exclusive partnerships with some of the world’s leading media distributors including The Associated Press (AP) and Dejero. Opening doors for new engagements, our collaborative partnerships provide you with a direct line to newspapers, media centres and broadcasters in over 15,000 newsrooms around the world. ExpertFile is constantly looking for new ways to boost visibility with key audiences. So far, we’re proud to say that we’ve connected journalists with expert sources on more than 30,000 unique topics – and the list is still growing! The Associated Press is the essential global news network, delivering fast, unbiased news from every corner of the world to all media platforms and formats. Founded in 1846, AP today is the most trusted source of independent news and information. On any given day, more than half the world’s population sees news from AP. 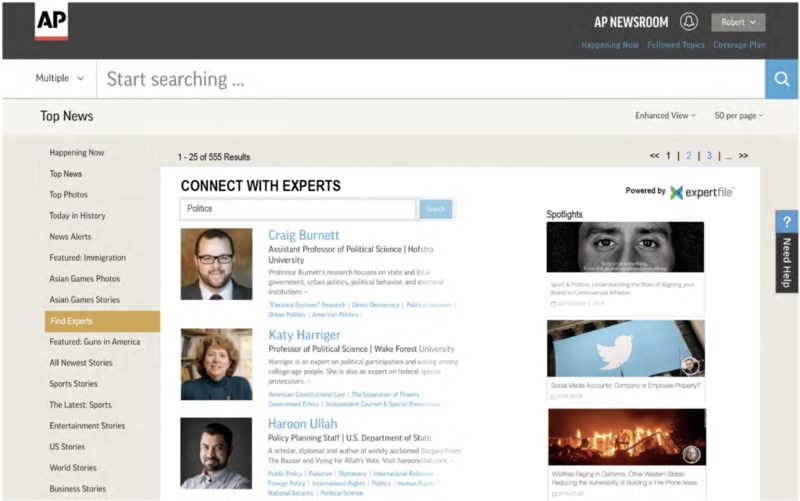 ExpertFile’s directory of experts, covering over 30,000 unique topics will be accessible to AP journalists and their members from global print, broadcast and digital media organizations. Journalists, Broadcasters, Corporations and Institutions. 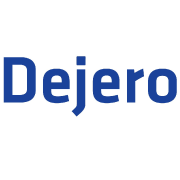 Dejero simplifies the remote acquisition, cloud management, and multiscreen distribution of professional live video over IP. Its LIVE+ platform enables broadcasters, media organizations, and mobile production companies to reliably reach their global TV, web and mobile audiences instantly and cost-effectively. Dejero’s proprietary cloud-based platform intelligently manages and bonds wired and wireless network connections to deliver broadcast-quality live video from virtually anywhere. 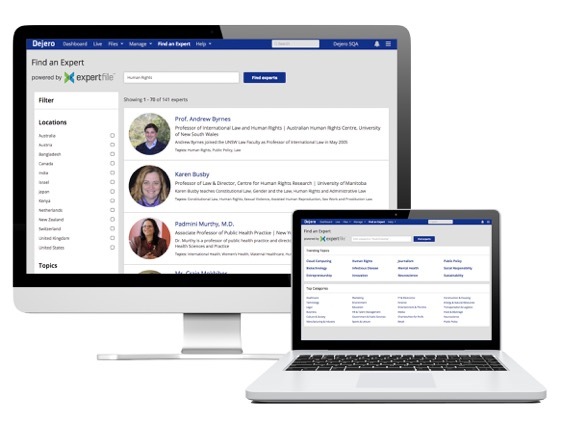 ExpertFile’s directory of experts, covering over 30,000 unique topics will be accessible to leading television broadcast outlets such as CNN, BBC, CBC, FOX, ABC, NBC and CBS and their local affiliates.